At Playtri, we want to help YOU be the best Athlete YOU can be. Learn more about how Playtri utilizes Retul technology to find bike fit that is optimal for performance, efficiency, injury prevention and comfort. There are many benefits to dynamic running drills for Athletes at all levels. Here we demonstrate three basic running drills and explain their importance. Cyclists of all ages and abilities should know how to fix a flat. If you have ten minutes to watch this video, we'll give you the basics how to get it done. Be sure to check the group training schedule and workshops on our Facebook page to learn first hand from our amazing coaches and employees! Ready to swim, bike, run?! Get out and TRI it! Here are some helpful hints for first-time triathletes. You are only a newbie once…then you are a TRIATHLETE! Triathlons might sound scary at first - but the truth is that if you know how to swim, can ride a bike and can run/walk - then completing a triathlon is totally do-able. The sport is incredibly beginner-friendly, welcoming and immensely rewarding. Three reasons – variety, community, and fun! Maybe you’ve been running a while, but are looking for some variety. Maybe you swam as a kid and would love to try it again. Perhaps you love riding your bike for miles on end, but would like some company. Triathlon can do all of that for you, and while triathlons are competitions, the participants are incredibly supportive, encouraging and motivating. Triathlons themselves are usually weekend events, with a party-like atmosphere and family friendly fun. For your fitness, triathlon training combines cross-training and cardiovascular benefits. It’s a great way to modify your training if the pounding of running is starting to bother your joints. By spreading your effort over three disciplines, you’ll minimize getting burned out, will improve flexibility and endurance, and will have found a sport that you’ll enjoy for a lifetime. There really is a triathlon for everyone. You’ll see four main distances, along with a ton of variations. For instance, super sprints are even shorter and are gaining in popularity. Do pay attention to whether the swim is a pool swim or an open water swim as this is important for training and race day decisions. Half Distance or 70.3: 1.2-mile (1.9 km) open water swim, a 56-mile (90 km) bike ride, and a 13.1-mile (21.1 km) run. You’ll compete the swim and bike portions and head to the finish line. This is a great option for those who can’t or just don’t like running. Still three segments, but with a run-bike-run order. And no swimming if you don’t know how or aren’t ready yet. These allow a team of two or three or even four athletes to compete. Running, mountain biking and cross-country skiing — all performed on snow (usually in colder climate areas). Make sure to triple check that you have everything on your race day checklist! Before the race, you’ll need to pick up your race number, swim cap, and stickers for your bike and helmet,. Some races require that you check in the day before the race, while others let you do it all on race day. You’ll be storing your bike (called racking) and gear in a central “transition” area. You might swim in a lake, river, ocean or pool. Some events have you start in the water, lining up and treading water until the horn goes off. Or you might start on a beach and run into the water. Others have you jumping feet-first off the pool deck or a dock. Most people will be swimming freestyle, but you’re allowed to swim any stroke you like. You’ll be following a course, swimming from swim start to swim finish – be sure to review the course route to see if you go around buoys or do more than one loop. You’ll be directed by volunteers to the “bike in,” and instructed when to dismount your bike and walk it back to your spot in the transition area. Remove your helmet, change to your running shoes (if you used cycling shoes on the bike), fasten on your race number, and head out for the run! Tips for setting YOURSELF UP FOR SUCCESS: PRACTICE, practice, practice! · Do some open water swim practice. It’s very different from pool swimming, and new triathletes often have anxiety about the swim. Playtri hosts an Open Water practice for swimmers at all levels beginning in the spring ~ watch our Facebook page for practice updates. · Practice transitions. Attend a transition clinic at your local Playtri. Practice in your front yard. Time spent in transition counts as part of your total race time. · Practice going from bike to run aka BRICK (Bike + Run + ick, get it?) Running directly after cycling feels very odd and the first 100 meters is usually the toughest. 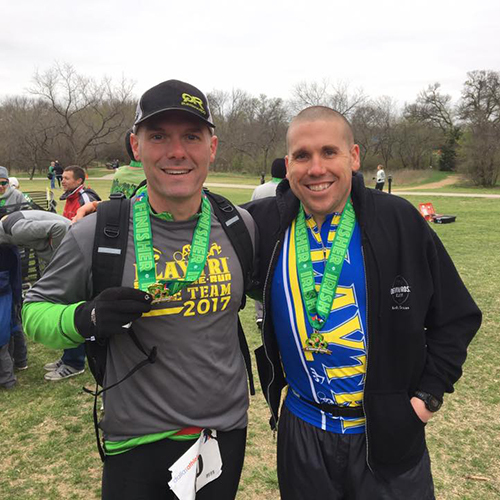 · Find a triathlon club or buddy. Triathlon is better with friends! Training partners help get you through the tough training and it’s fun to compare notes at the end of the race. · Read the athlete guide and/or race website. Every race has one, and every race is different. It’s your responsibility to understand the schedule of events and rules. · Go to the athlete meeting. This is a great way to get a feel for the course conditions and anything weird that could surprise you on race day. Plus, you can ask questions. · Make a strong mental note of where your station is in transition – it can be a time-saver to know your spot. Before the race, make sure you know where you’ll be entering and exiting the transition area so you feel less pressured during the race. Bodymark: Race number on arm and leg with age on calf with temporary tattoo or black marker. Clydesdale/Athena: Race award categories for men over 220 pounds and women over 165 pounds. Time Trial Start: Racers usually line up by their race number, and a starter has a racer begin every few seconds. Three second intervals are common. So, if there is a 500 person race, and racers begin every three seconds, it would take 25 minutes for every racer to enter the water. TT bike/tri bike: Special road bikes made for triathlon racing, with flat handlebars and a set of aerobars. They also have a different geometry than a road bike that engages your glutes more so it takes load off your hamstrings which is better for running after the bike. Wave Start: Perhaps the most common format for a triathlon start is a wave start. A wave start typically involves splitting into “waves” which are predefined by age group and gender. Different age groups often are given different colored swim caps. Elites and other special waves such as Clydesdales, Athenas, or teams may have their own waves. The wave is the same thing as a “heat”, and a typical wave will have anywhere from 15 to 50 people in it and start times are staggered by 2-3 minutes between waves. Wetsuit: A close-fitting suit made of neoprene and worn by swimmers when they are in cold water to keep their bodies warm. Wetsuits also make you more buoyant and faster. USAT rules state that competitors may wear wetsuits if the water temperature is 78 degrees Fahrenheit or lower; however age group participants cannot wear wetsuits in water temperatures equal to or greater than 84 degrees Fahrenheit. Want to learn more or ask other Triathletes for their input? Follow Playtri on social media and visit the Youtube Channel Playtri TV for more Triathlon 101 tips and tricks.